3rd story Condo, 2 Bedrooms, 2 Baths, (Sleeps MAX 4 guest! ), Amazing Views! Get away from it all or stay connected to it all in this wonderful condo. This condo is great for a romantic getaway or a fun-filled family vacation. Enjoy the views of the waves washing up on the beach or the white water washing over the off shore rocks. Watch otters, whales, seagulls, pelicans, fishing boats, and the occasional surfers. 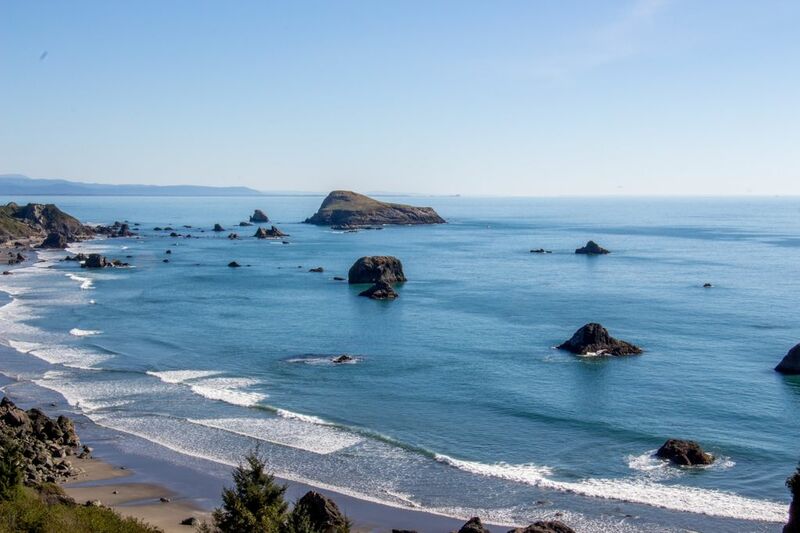 This is a great home base for all that the Southern Oregon Coast has to offer. You can jump right on to the Coast hiking trail from the condo for hours of hiking exploration. Rent kayaks for a river or ocean trip. Charter a boat for a great fishing experience with a local guide, or try your hand for Surf Perch right from the beach. There are days worth of hiking and beach trails all within 20 min from the home. When you are ready to come in from the great outdoors this condo greets you with superior amenities. Stay connected with high speed Wi-Fi (Bring your own laptop). Enjoy your favorite TV shows, sports teams, and movies on the high definition flat screen TV located in the living room. Light a toasty fire and grab a good book or a loved one and snuggle up for a quiet evening. There is a great jetted tub to soak road or trail weary bones. Books, puzzles, and the great views are all available for your pleasure. Of course this home is stocked with all the necessities of a functioning home. Linens, beach towels, cook ware etc. are all ready for your use. Please email us if you would like to see some more pictures. THIS IS A 3RD FLOOR CONDO. THERE IS NO ELEVATOR, ONLY STAIRS. Hello! We are Lonnie and Lori. We love the ocean and have always dreamed about having a place to get-away and relax. We are really excited to share our home with you and hope that your stay will be very memorable. The view is our favorite part of our home. We can sit for hours and watch the water and there is always something changing. Of course we are always on the look out for whales, but watching the surfers at the end of the beach and even the fisherman has become quite entertaining. At night we crack open the sliding door and listen to the soothing sound of the ocean. During crabbing season there are a lot of boats out at night that have big lights and you can see the crew working. Vacations are meant to be relaxing and replenishing so we tried to capture the sprit of that in our home and it feels great to us. We furnished it with comfortable but modern furnishings, left clutter to a minimum, and let the view take center stage. We hope you enjoy our home as much as we do. Hall bathroom has jet tub and shower combo. Master bathroom has only the shower. Beds are made upon arrival. We supply a set of beach towels, and two sets of bath towels for guest use. There are also wash clothes and kitchen towels. We have throws around the rental as well. We do supply Laundry Soap. We do supply dryer sheets. There is no designated parking but several parking spots available. There are high quality towels and several here for guest use. There is also a set of Beach Towels. Basic Pantry items and spices. Well Stocked for all your major cooking needs. There is only one TV, which is a flat screen located in the living room. There is Basic cable available for guests. Gorgeous view over looking the ocean on a bluff. Two chairs and small table. 3rd floor unit with stairs. No elevator. We arrived to find our rental had not been cleaned! We had just had a six hour flight and then a three hour drive to Brookings ! We contacted managers and they wanted to clean it then but we were to tired. We told them we would do it ourself . They refunded our cleaning fee and gave us a gift certificate For dinner. We will not be back ! We are so sorry for the error on our part! We want our guests to have a wonderful experience and are so sorry to have started yours off on the wrong foot. We will do better! Very peaceful & picturesque !! Well-equipped, comfortable base to enjoy & explore the South Coast. We'll return !! Really great location on the coast! Trail to beach and Harris Beach right next door. Condo well kept and had everything we needed. Will be back! A beautiful condo, everything to make it a comfortable home! The views are AMAZING!!!! So glad you enjoyed your stay! Thank you for taking the time to leave a review. We hope you can stay with us again sometime. Beautiful ocean view! Lodging was comfortable, clean, and spacious. Plan to come back again. Totally awesome views. Just as described. Thank you for taking the time to leave a review. We are very sorry about the towels! We passed along your comment to the cleaning staff and will make sure that is addressed. We are glad you were able to enjoy your stay! Thank you.